Acasta Lieutenant under Capt. Beaver, 18th Nov. 1808. George Edward Marshall is the son of an old Commander in the R.N., who lost his health on the coast of Africa, and was from that cause, as well as from the effect of wounds, obliged to retire from active service. His brother, Lieut. Thos. Marshall, R.M., was killed in the Repulse 74, Capt. Hon. Arthur Kaye Legge, at the passage of the Dardanells, in Feb. 1807. 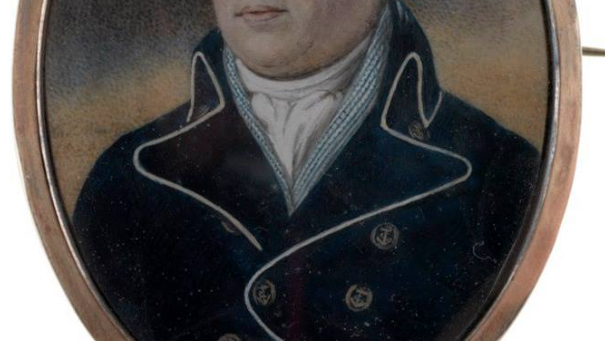 This officer entered the Navy, 16 Feb. 1801, on board the Invincible 74, Capt. John Rennie, bearing the flag of Rear-Admiral Thos. Totty in Yarmouth Roads ; and became Midshipman, soon afterwards, of the Assistance 50, Capt. Rich. Lee, under whom he was wrecked, between Dunkerque and Gravelines, 29 March, 1802. During the five years which preceded his promotion to the rank of Lieutenant, Mr. Marshall, it appears, was employed on the Newfoundland and Channel stations in the Falcon sloop, Capt. Henry Manaton Ommanney, Goliath 74, Capt. Chas. Brisbane, and Phoenix and Tribune frigates, both commanded by Capt. Thos. Baker. In the Falcon, at the commencement of the war, he assisted in taking possession of the islands of St. Pierre and Miquelon ; and in the Phoenix he was present, as Master's Mate, in Sir Rich. Strachan's action, 4 Nov. 1805 ; on which occasion he was sent on board one of the prize-ships to aid in navigating her into port. While serving in the Tribune, we find him contributing, 29 April, 1807, to the destruction, by that ship and the Iris, of the greater part of a convoy of 30 vessels, passing from Ferrol to Bilboa under the protection of several gun-boats. He was also a participator in many boat affairs on the coast of France. On being promoted, as above, he joined the Neptune 98, Capt. Sir Thos. Williams, at the time in the Channel; and he was afterwards appointed—18 Nov. 1808, to the Acasta 40, Capt. Philip Beaver, under whom he served as First-Lieutenant at the capture of Martinique and the Saintes in 1809—25 June, 1810 (after seven months of half-pay), to the Amelia 38, Capt. Hon. Fred. Paul Irby, attached to the force in the Channel— 17 Aug. following, and 27 April, 1811, to the Hannibal'74.